O’FALLON – The O’Fallon-Shiloh Chamber of Commerce and O’Fallon Weekly hosted a candidate forum for contested city council races on Thursday, March 14. Jessica Lotz was selected to provide opening remarks for Ward 2, and she discussed why she would be the right fit for city council. “I have attended city meetings for two years, and I can see where my talents and interests align with what the city needs at this time,” said the O’Fallon native and OTHS graduate. Lotz’s husband, Craig, and her son, Ryan, are also active in the community. She said that her experience as the mom of a child that both uses the busy O’Fallon Sports Park and travels for games helps give her insight into what families want and need when they come to town for games. Bob Kueker has been the sitting alderman for Ward 2 for the past four years. He and his wife are OTHS graduates, and he has served as a District 90 school board member and an O’Fallon Public Library board member, as well as other service positions. Kueker holds an MBA with a focus on accounting, and is a retired banker. He explained that he was fiscally conservative, and “will make the best decisions to assure your money is spent in the most fiscally responsible manner.” He continued to explain that he has voted against increasing the city debt and voted against the sale of the city water. Kueker was the first to answer during the random question round, answering “How can you help foster involvement of the residents in your ward in the day to day operations of the city?” He explained that he has held two ward meetings that have had low attendance, and he would consider advertising more, including possibly taking out paid ads to catch the attention of residents. He would also consider forming a Ward 2 Facebook page to allow for bringing in even more residents. Lotz was asked how she could balance the needs of the ward with the needs of the city. “I actually really enjoy the idea of being one of 14 elected officials. I think this balance to government is what keeps us on our toes and makes us more efficient. Being one of 14 allows you the opportunity to consider the best interests of the city as we move forward in certain things, but it also enables you to look at the residents who voted to elect you and figure out f this specific issue is something that will maybe disproportionately affect your ward more than other wards,” she said. Both candidates were asked why they felt they were more qualified than their opponent to be elected to city council. Lotz was first to answer. “I have worked hard to build O’Fallon through service to others. I enjoy seeing others succeed. I’m running for office because I want to continue that success. Most importantly, I’m an involved resident. Through my participation in the Chamber of Commerce where I served as the Vice President and ultimately the President, and working in various leadership groups, boards of directors, local fundraising committees and the PTO, I have worked hard to connect with residents and give back in meaningful ways. Being involved keeps me in constant communication with residents,” she explained, adding that she will be ready to go on day one since she has attended meetings for two years, and that her constant resident communication gives her a sense of what people want to see in O’Fallon. Kueker said “Going through all the phases of life in O’Fallon is a great advantage, even up to the retired person. I see what people need from young to old.” Kueker said that he also said that he has an insight into the sports park through his athletic granddaughter. He continued “I think the biggest challenge the City of O’Fallon phases is managing growth. We need to prioritize public safety, infrastructure needs, and maintain our future quality of life.” Kueker said that O’Fallon schools should also be a priority, and should be ever present in the planning of the city’s future. Both candidates were also asked about possibly expanding Seven Hills Road to help alleviate traffic concerns. Lotz said “One of the things I’ve learned most about is how expensive and complicated public infrastructure, particularly with respect to roads and sidewalks, can be. I agree that Seven Hills needs to be extended.” She shared that her home backs up to the road in question, and that her son tried to climb their fence to get to the road when he was younger. “Seven Hills is a busy road. We’ve got a school that resides on the road. It’s a heavily trafficked area. The complicating issue comes in when your realize that the entirety of Seven Hills Road is not owned 100 percent by the city. The north end of Seven Hills Road, to my understanding, is owned by the township. While I’m sure there’s a desire to make Seven Hills more pedestrian friendly and more traffic friendly, especially as some of the new developments happen out by the YMCA, we’ll just have to continue to work with the other bodies that own roads in that part of town to make sure that we plan appropriately for the traffic patterns and work together to make it happen,” she continued. Kueker was selected first to present closing remarks, and continued his opening statement, discussing the issues that he has supported or opposed over the past four years, including supporting the demolishing of Southview Plaza, working towards making Seven Hills Road safer, and supporting things like lowered taxes, infrastructure to alleviate drainage issues, new purchasing policies, and he added that he reviews all the bills that the city pays. “There are some areas that I want to give special attention to in the future. I’ve mentioned communication with residents. I want to continue to work on Seven Hills Road. What I want to do is foster smart growth and further economic development through projects such as the development of the Rieder Road intersection. That’s the next big thing,” he said. He thanked the audience for their attention, and said he would love their support to continue to serve Ward 2 as alderman for another four years. She added some of her other activities around town and said that she did not do these things so that she was running for office, rather she was running for office because she had done these things and has pride in her community. To read about the Ward 4 candidates, click here. To read about the Ward 6 candidates, click here. 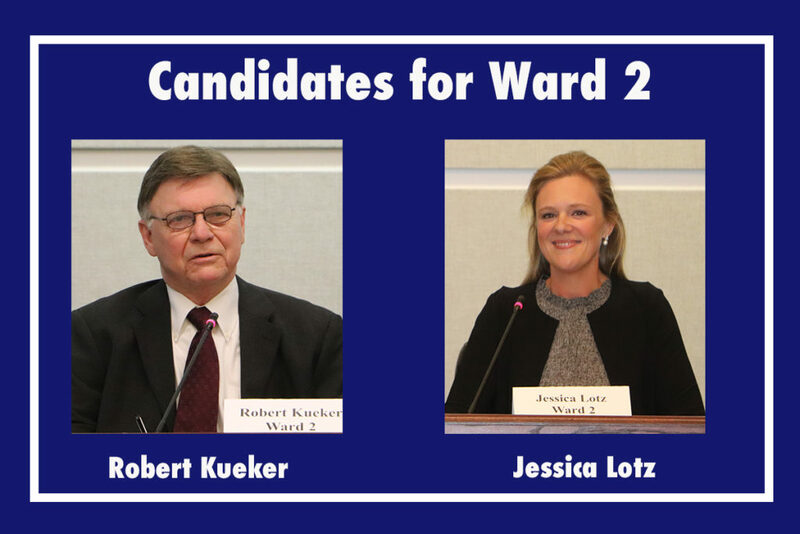 To read about the Ward 7 candidates, click here.